Looking for holiday gifts for the special men in your life? Having tried both of these fragrances, here are two great suggestions: Perry Ellis Aqua Extreme, the new fragrance designed by Jean-Claude Delville is fresh and vibrant, a masculine fragrance that is as adventurous as the wearer, and Original Penguin® Premium Blend created by Harry Frémont, the sixth scent in its fragrance line, with cool, crisp notes and the famous Pete the Penguin® logo on the attractive frosted bottle. Perfect as a gift for the holidays for the fashionable and adventurous men on your list, or as a well-deserved gift for oneself, Perry Ellis Aqua Extreme makes a statement with its attractive packaging and its sprayed-blue bottle to capture the feel of the ocean, and hefty feel in the hand, proudly bearing the name in light blue lettering. Created by Jean-Claude Delville, Senior Perfumer and "the nose" at Drom Fragrances, the fragrance was designed with the mindset of a "sheer, refreshing and masculine composition with lasting quality and intrigue." Picking up the idea behind Perry Ellis Aqua which launched in 2012, Perry Ellis Aqua Extreme takes a bold step forward and goes beyond the original Aqua to create a bold, fun, and adventurous fragrance with lasting power. For this special fragrance, Jean-Claude Delville blended an inspired mix of ingredients that include notes of bergamot, verbena, geranium, blue lavender, juniper, labdanum, tobacco leaf, and milk wood, which warms on the skin to create a memorable and lasting scent. When Edward F. Nesta tried the fragrance, the result elicited heady, bold, and desirable aromas that lingered on the skin to create an exciting and enticing experience. The 3.4 fluid ounce/100 ml eau de toilette Perry Ellis Aqua Extreme fragrance comes in a handsome blue bottle with a blue stopper proudly bearing the Perry Ellis Aqua Extreme name written in white lettering on the front of the bottle. 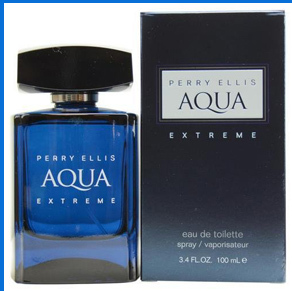 Perry Ellis Aqua Extreme eau de toilette is available for purchase online at www.PerryEllis.com as well as in the United States at Macy's (www.Macys.com), Dillard's (www.Dillards.com), Belk (www.Belk.com), Lord & Taylor (www.LordandTaylor.com), Boscov's (www.Boscovs.com), and other fine stores, and retails for $60.00. It will also be available in Mexico, South America, the Middle East, and beyond. 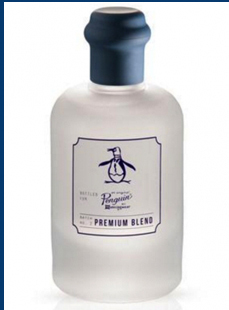 Original Penguin® Premium Blend is the sixth scent in the fragrance line. Master Perfumer Harry Frémont took as inspiration "a laid-back coastal road trip with the windows down amid the fresh sea breeze," a fragrance that is perfect for day or evening wear and for all occasions. Original Penguin® Premium Blend is a progression from Original Penguin® Original Blend, which was launched in 2015. For Original Penguin® Premium Blend fragrance, Harry Frémont used ingredients to elicit scent memory with a lovely mélange of bergamot, fresh lime peel, wild spearmint, Mediterranean rosemary violet leaves, fresh musk, driftwood and woody vetiver to create this unique and appealing scent. Edward F. Nesta tried this fragrance and the result was a contemporary clean and fresh, subtle fragrance with slight marine undertones that appealed to the senses. Pop culture artist Dave White designed the attractive frosted glass bottle with its blue top which prominently features the iconic "Pete the Penguin®" logo with Batch No. 2 Premium Blend written in navy blue on the front of the bottle. The contemporary feel "conveys the lifestyle brand's social messaging with its #BeAnOriginal hastag." Original Penguin® Premium Blend is as original as the wearer. The 3.4 fluid ounce/100 ml eau de toilette spray Original Penguin® Premium Blend is available for purchase in the United States at Nordstrom (www.Shop.Nordstrom.com), Dillard's (www.Dillards.com), Lord & Taylor (www.LordandTaylor.com), The Buckle (www.Buckle.com), Boscov's (www.Boscovs.com), and other fine stores, and retails for $65.00. It will also be available in the United Kingdom, Mexico, Chile, Colombia, Panama, the Middle East, Hong Kong, the Philippines, LATAM, and Duty Free Shops. "In 1955, Minneapolis-based Munsingwear® - an underwear and military supply company - ironically became the touchstone of suburban sport with the introduction of the first iconic golf shirt to America - an ORIGINAL PENGUIN®. Known for its unique, humorous and detail-oriented clothing. Original Penguin offers a full range of men's, women's and children's clothing, accessories and fragrances. Original Penguin is present in the United States, Canada, Europe and South America with over 1,250 points of sale, more than 61 Original Penguin stores worldwide and two dedicated e-commerce websites: www.OriginalPenguin.com and www.OriginalPenguin.co.uk." About Perry Ellis International, Inc.
"Perry Ellis International, Inc. is a leading designer, distributor and licensor of a broad line of high quality men's and women's apparel, accessories and fragrances. The Company's collection of dress and casual shirts, golf sportswear, sweaters, dress pants, casual pants and shorts, jeans wear, active wear, dresses and men's and women's swimwear is available through all major levels of retail distribution." © November 2016. Luxury Experience. www.LuxuryExperience.com. All rights reserved.